Jetstar will operate the Boeing 787-8 alongside the forthcoming Airbus A321neoLR on some Australia-Bali routes, the chief executive of the Qantas-owned low-cost carrier says. 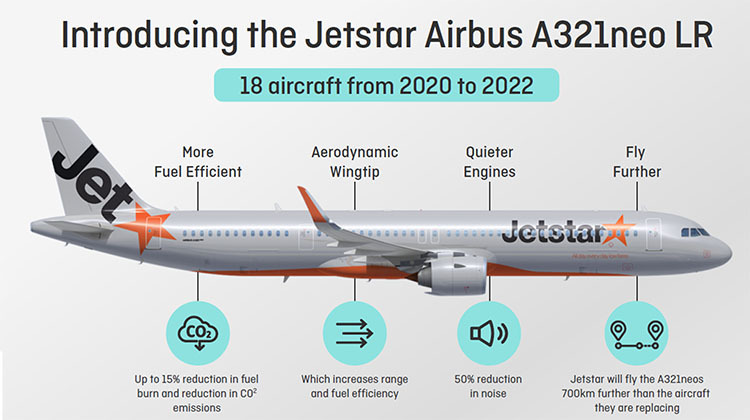 Eighteen A321neoLR aircraft are due to join the Jetstar Australia and New Zealand fleet from mid-2020 to 2022 after Qantas announced in February it had restructured its long-standing Airbus A320neo order to include 18 long-range A321neoLR aircraft. Jetstar has earmarked the A321neoLR for both Australian domestic flights and services to Bali from Melbourne (2,363nm) and Sydney (2,495mm). That would free up Boeing 787-8s currently serving Bali to be redeployed to other destinations in China, Thailand and Vietnam, as well as Honolulu in the United States. However, the 787s will not disappear completely from the Bali route, ensuring that Jetstar would continue to offer a business class product to the popular Indonesian tourist destination. “What we are not doing is we are not replacing the 787s to Bali,” Jetstar CEO Gareth Evans told delegates at the Routes Asia 2018 conference in Brisbane on Sunday. Qantas placed its original order for the A320neo series in October 2011, while the CFM LEAP-1A engine was selected for the aircraft in 2012. Evans said in addition to the new technology and lower cost base, the A321neoLR gave Jetstar a flexible aircraft capable of operating domestically in Australia during the day and then an overnight international service from Australia’s east coast to Bali or an international route of similar stage length. However, the A321neoLR would be flying in domestic Australia for the “vast majority of the time”, he said. As a consequence, these aircraft were expected follow Jetstar’s single-class narrowbody configuration. “We haven’t finalised the configuration of these planes yet, but I think it is highly unlikely they will have business class because effectively that will mean we will be introducing business class domestically in Australia,” Evans said. “I think I would have to go and talk to my boss in very hushed tones if I was thinking about doing that. The value of such an aircraft that can seamlessly switch between international and domestic operations had already been shown at Qantas, whose fleet of 18 A330-200s and 10 A330-300s are deployed within Australia, across the Tasman and to Asia and Honolulu. “We’ve used the A330s in Qantas extremely flexibly and drew in a lot of stability and value into the Qantas network as a result of that,” Evans said. In February, Qantas reported net profit of $607 million for the six months to December 31 2017, with all of the company’s operating segments – Qantas Domestic, Qantas International, Jetstar Group and Qantas Loyalty – profitable, with healthy operating margins. Qantas chief executive Alan Joyce said the decision to go for the 18 A321neoLRs was made only after Jetstar satisfied the business case for new aircraft amid the competing cases for capital from all parts of the company. “What’s great about the group at the moment is that we have a lot of the divisions performing really well,” Joyce told reporters on February 22. “We have to decide where the best business case is, where we’re going to get the best return. Qantas chief financial officer Tino La Spina said at the results presentation the arrival of 18 A321neoLRs would also coincide with the “option to on a seat to seat basis” retire 22 of the A320ceo family of aircraft. “If we’ve got the particular tailwinds we can choose not to retire those, they’re still quite young aircraft, so we can have the ability to grow,” La Spina said. The A321neoLR (or A321LR for short) completed its first fight on January 31, kicking off a 100-hour flight test program. Certification from the European Aviation Safety Agency (EASA) and US Federal Aviation Administration (FAA) is forecast to occur in the second quarter of calendar 2018, with entry into service before the end of the year. Aviation thinktank CAPA – Centre for Aviation projected the 18 A321neoLRS would free up the equivalent of three 787-8s for other services. Further, CAPA said the 18 new narrowbodies would provide limited capacity to experiment with new routes from Australia, given most of these aircraft were already earmarked for existing routes. “Jetstar has adopted a conservative approach, and has plenty of time to decide on the relatively small number of new long haul narrowbody routes it will launch with A321neoLRs in the early part of next decade,” CAPA said in a research note dated March 7. “The risk in the relatively conservative approach to long-haul growth is that competitors could beat Jetstar to several new long-haul routes from both Australia and Asia. The Jetstar website shows the airline operating 12 flights from Melbourne and seven flights from Sydney to Bali a week with 787-8s for the week starting Sunday March 25 2018. While some LCCs subscribed to the model of a single fleet type in order to keeps costs low and keep their operations simple, Jetstar was a little bit different. There are four aircraft types in the Jetstar group of airlines across the Asia Pacific – in addition to Australia and New Zealand there are Jetstar-branded airlines based in Japan, Singapore and Vietnam – comprising Airbus A320 and A321 narrowbodies, Boeing 787-8 widebodies and Dash 8 Q300 turboprops. “You could possibly say we’ve overcomplicated it already but I don’t think that is the case,” Evans explained. Please Jetstar reconsider the flights from Townsville to Bali. Very popular . Will pay a bit more. The A321LR is the perfect airframe for Bali well done Jetstar. not profitable. no interest from travellers to Townsville.. no one wants to try again. Great more people on longer flights with less toilets and a single aisle that will turn into a long line. Any flight longer than 2.5 hours id rather pay a few dollars more for a larger twin aisle with less toilet ques. I have to agree with David, whatever model of A321 is selected, great aircraft that they are, they will not prove popular with the customers on anything but domestic services within Oz. To even consider international routes with them in all ECY cattle seating is not going to impress even the most budget conscious passenger. Sorry JQ and QF you have got in wrong this time. Truly even East West/Visa versa transcontinental services within Oz should only be serviced with A330 type equipment not these ,light twins, lets get serious please. Yet again the paying punter is getting short odds with the bookmaker. It makes for a very unpleasant flying event stuck in a jetstar seat, in particular a single aisle. QANTAS was once a great airline. Now back in the middle of the pack, wake the board up someone, please. Having done the Perth/Brisbane route over the years on a very frequent basis I did get into the habit of only booking on an A33o even if I had to wait. The 737 was cramped and often no iPad or seat back entertainment. I might as well have saved my money and flown Virgin. I now fly to the Middle East frequently out of Brisbane on Emirates and then a connecting flight of 56minutes in a 777, the service is incredible. Packing people into planes maybe what shareholders want and some travellers on a budget but the majority of us just want service and destinations in relative comfort and as I have found this is at Emirates. Domestic service great, I agree with everyone else, JQ and JF, you do have it wrong. Why not survey customers who actually fly these routes and get an opinion of what WE the PAYING customers would like. Come to some compromise with us. I don’t expect first class all the way (would be nice), but decent size seats, deeper cushioning, wide aisles or at least 2, oh and please, reduce the price of food and beverages.. I would like some spending money when I get to my destination. Today marks the end of the Jetstar service from Townsville to Bali. A very sad day indeed for the Residents of Townsville and surrounding areas. Seems incredible that the aircraft has substantially full passenger loads on most flights, however Jetstar management claims that the service is unprofitable. Hopefully another airline will reinstate this service. I bet the price of tickets down go down like the size of the plane has, but I bet you everything will go up. Drinks and food will go up even more, too expensive now for what it is. As the QF CFO states that 22 A320 ceo to be retired are relatively young then why does mainline still operate 737-800s that were first delivered in 2002.Seems Jetstar are a higher priority than mainline for management.